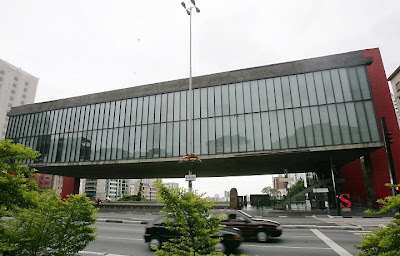 The MASP (Art Museum of São Paulo) is the dream of its creator, Assis Chateaubriand*, of bringing together pieces of artworks and paintings to build a museum. When it was inaugurated in 1947, was far from becoming what it's today: the most important collection in the southern hemisphere and is considered a treasure of humanity. Carrying the mission to get artworks, Assis Chateaubriand allowed his huge group of media to help the collection of funds for the acquisition of works of art. Three other people were also very important to this project: Edmundo Monteiro (CEO of the media group), the couple Pietro Maria Bardi (journalist and critic of art in Italy) and his wife, the architect Lina Bo. The proposed construction of the headquarters of MASP aimed at preserving the vision of the Serra da Cantareira and the city center. It explains the proposed architecture of the building. It is the only one of the world for its peculiarity: its structure is suspended on four pillars separated by a gap of 74 meters. What would be the vision of the mountain, which unfortunately was later covered by buildings. It's inauguration was held in November of 1968 with the presence of Queen Elizabeth II of England. The MASP holds Italian works by Raphael, Andrea Mantegna, Bellini and Botticceli; of Flemish painters like Rembrandt, Frans Hals, Memling and Cranach. Among the Spaniards are Velazquez and Goya. Most of the European art is French. We appreciate the four portraits of the daughters of Luiz XV, painted by Nattier, or allegories of the four seasons of Delacroix. The impressionist movement, can be found by several works of Renoir, Manet, Monet, Cézanne and Degas. The post-Impressionists, are represented by the paintings of Van Gogh and Toulouse-Lautrec. One of the collection's highlight, is the space devoted to a complete collection of sculptures by Edgar Degas. A collection of 73 pieces of bronze, can only be seen fully in Masp and in a few museums such as the Metropolitan in New York, or the D `Orsay Museum in Paris. The MASP also offers music, film and lectures. Two auditoriums designed by Lina Bo bring a space for these multiple activities. 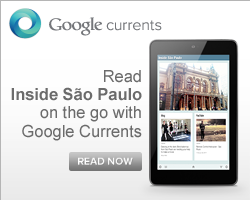 (*) Important Brazilian businessman, owner of business communication. He was founder and director of the then main chain press of Brazil, the Daily Users: 34 newspapers, 36 radio stations, 18 television stations, one news agency, one weekly magazine (The Cruise), one monthly magazine (for cigarettes) as well the many magazines for children. When: Thursday, from 11am till 8pm. Tuesday, Wednesday, Friday, Saturday, Sunday and Holidays, from 11am till 6pm. (Tickets stop to selling an hour before closing). How much: R$ 15 and R$ 7 (students). Free for under 10 and above 60. Also free every Tuesday.